A $408 000 University of Tasmania collaboration between the School of Architecture and Design's Centre for Sustainable Architecture with Wood, and the School of Engineering and ICT's eLogistics Group. This Project has contributed to improvements in the recovery, quality and value of sawn hardwoods by using sensors and real-time data to monitor timber boards as they are air-dried in-situ in timber yards. This has enabled better operational decision making in relation to wastage and efficiency. Tasmania holds a reputation as one of Australia's leading producers of premium wines, but our vineyards are susceptible to serious damage from frost, diseases such as botrytis and powdery mildew and other environmental threats. Sense-T's Stage 1 Viticulture Project (2012-2015) was undertaken by researchers from the Tasmanian Institute of Agriculture (TIA) and CSIRO, who worked closely with Wine Tasmania and local vineyards. They helped the industry to manage disease risks, optimise production and minimise environmental impact by bringing together real-time sensor data, weather predictions and historical information about disease patterns. Sense-T, the Tasmanian Institute of of Agriculture (TIA) and the University of Tasmania's Information and Communication Technology discipline are continuing this work. 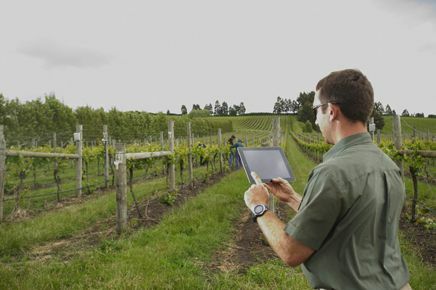 They have created an innovative smartphone app that provides vineyard managers a simple and accurate way to monitor onfarm growing conditions and understand disease threats for better decision making. Having this information so easily available to vineyards is helping make management decisions easier, more environmentally responsive and generate greater economic value for growers. This Project also builds on the capacity for the industry to expand, by creating and satisfying demand through consistent yield and quality. A pre-commercial version of the VitiApp will be released soon for industry testing. A $90 000 project (Sense-T $61 000) conducted by Simplot Australia Pty Ltd. Sensors were placed in two seed potato stores to measure CO2 levels in storage bins and determine the optimum storage conditions. Annual losses from poor seed potato storage are estimated to lower crop yields by 5 per cent and cost Tasmanian producers more than $6 million per annum. Identifying storage improvements enable a significant increase in on-farm productivity, efficiency and income. Having access to a free online tool to help predict livestock feed availability, farmers are boosting their productivity, efficiency and sustainability. This project used sensors and data to enable farmers to prepare for different scenarios and further developed on-animal sensors to better monitor health, grazing and productivity. 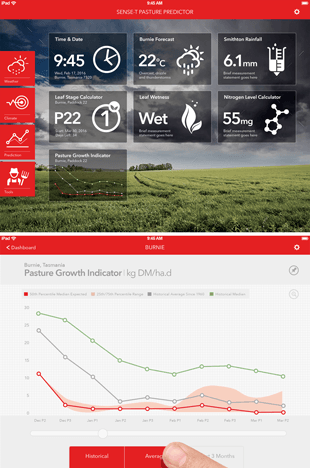 A cloud-based capability was successfully developed using the Sense-T Data Platform to ingest real-time sensor data and regional climate data and fuse those with a pasture growth model, delivering pasture growth estimates via a free web interface. The incorporation of such a complex mechanistic model in a cloud environment is unique and at the forefront globally, providing outputs at the best possible accuracy and reliability. The outcome – Pasture Predictor - gives farmers the capacity to manipulate scenarios in ways that allow them to make decisions based on their on-farm risks. The publicly-available tool delivers weekly updates on pasture growth rates across key grazing regions of Tasmania. Farmers can use their iPads to access a suite of user-friendly apps calculating climate factors such as moisture, light, and temperature, and showing the degree of growth stress due to the limitation of key resources such as water. Others estimate the likely time of leaf appearance of perennial ryegrass, the optimal application of nitrogen fertiliser (balancing the cost with potential yield), and a grazing rotation calculator so farmers know the best time to move livestock between paddocks. The apps were developed after extensive scoping with industry to ensure they provided exactly what was needed. In future, an irrigation calculator will determine what’s required weekly, using both historical and future climate data. The forecasts will be shown for any region in Australia. On-cow sensors were enhanced to generate new understanding of grazing behaviours. 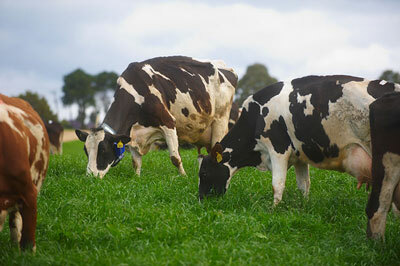 Each individual cow’s grazing, resting, ruminating and walking can be assessed, leading to improved efficiency and productivity of pasture based dairy herds. In addition, the sensors can be used to identify bite rates of individual cows which could lead to better prediction of pasture intake – in real time. This is a highly sought after metric that could help farmers better manage pasture utilisation and supplementary feeding. In grazing systems, pasture optimisation is a key profit driver, and grain inputs are a significant proportion of total variable costs. A 10% boost in home forage consumption, for example, is estimated to save an average dairy farm more than $100,000. Having real-time information to understand current and likely pasture availability helps farmers adjust grazing regimes such as stocking rates and rotation speed. Grain or other supplementary feed can be sourced as required, depending on likely pasture availability. A specific outcome from the on-animal sensing activity was new knowledge that quantified the reduction in grazing time after the morning milking when cows are fed additional grain per animal per day. Farmers could subsequently reduce grain feeding, or alternatively feed grain in different ways to optimise total feed (pasture and grain) conversion efficiency. The accuracy and sensitivity of on-animal sensors were also evaluated for their ability to detect when dairy cows were about to be on heat. As well as achieving efficiencies in the use of resources such as water, nutrients, feed and labour, the continuous monitoring of livestock - and interpretation of behavioural and production data - are directly applicable further up the supply chain to objectively demonstrate the health and welfare of grazing animals, and the ethical production of dairy products. Next steps include attracting further co-investment to continue research, investigating a commercialisation phase and further enhance international linkages, initiated so far with New Zealand, South Africa and Ireland. Faced with a “horrible summer” with record low rainfalls, farmers in North East Tasmania braced for tough restrictions on the amount of water they could access from local river catchments. The Sense-T research project provided farmers with real-time information on the Ringarooma catchment and they were able to work together to reduce extractions and to release water from private storage dams into the river to maintain healthy levels at critical times or locations. These actions – in collaboration and often via a 24-hour roster system avoided further stress on the environment. Irrigators in the Ringarooma catchment were able to actively manage the sharing of water to maintain availability of licensed water when irrigation is time-critical, for the viability of their community and businesses, while maintaining flows required to ensure river health was not degraded. Stage 2 of the Adaptive Water Management research project expanded on Stage 1 successes by enhancing the scale, complexity, and outcomes of real-time monitoring and prediction for catchment water management, data analytics, and novel dashboard applications. The outcome was more adaptive and inclusive water management that enhanced availability for irrigation and other uses and maintained water quality. Adaptive management reflects the delivery of real-time information that helps irrigators understand the impacts of their water use, predict what lies ahead, and take timely group action. Using sensor technology, daily data streams from many locations in the catchment were displayed on a dashboard and updated several times per day, including predictions of river flows, daily rainfall and evapotranspiration. There was a substantial economic benefit of the adaptive management practice. Newly-developed technologies underpinning the use of real-time data included efficient data platform services for ingesting and exposing sensor data from multiple spatial and temporal sources at widely varying time steps, making full use of the unique Sense-T Data Platform. In addition, prediction algorithms were developed based on new applications of machine-learning methods to stream flow and weather predictions. The technology is applicable to a wide range of catchment settings where there is a technical need and enough social capital to support group actions. Commercialisation options are being explored, while the work could also be useful in forecasting algal blooms. Farmers are improving their water management and cutting costs by using real-time data from sensors to monitor and control their irrigation equipment. The Irrigation Gateway project saw the development of an end-to-end system to monitor pumps, pivot irrigators and communicate across vast distances on farms where there may not be existing communications infrastructure such as WiFi connectivity. An enterprise data system aggregates installations across multiple sites and integrates with the Sense-T Data Platform. The system is unique in that it integrates water and power data, improving overall efficiency of irrigation infrastructure and resource use. User-facing software enables farmers to directly access the hardware on their farms. This provides oversight of data or the performance of control actions such as remotely turning pumps on and off. Farmers are able to identify inefficient or failing components in their irrigation systems and intervene early to fix faults. This saves time and money and provides peace of mind, particularly where farmers have remote pump sheds that are difficult to reach because of either distance or terrain. Close consultation with industry participants meant that prototype hardware and software were in the hands of farmers and in active use at an early stage, with valuable feedback absorbed into the design and development process. Farmers indicated that early prototype equipment with basic functionality – monitoring pump stations and responding to blockages and other unanticipated events – had saved tens of thousands of dollars in potential pump repairs. Custom-built hardware devices were designed and manufactured, including the Sensor Gateway, Lumio (irrigation monitor) and LoRa radio module. The groundbreaking LoRa (low-energy, long-range) technology provides robust and inexpensive communication between devices and systems. The project was the driving force behind several other developments for key partner Definium Technologies, including a collaboration with UK company Odyssey Sensors to build tools for water trough monitoring for farms and water salinity sensors for use in Bangladesh, and a distribution partnership with Semtech. Other project outcomes included further employment in sensor design and manufacturing in Tasmania with the establishment of an Advanced Sensor Manufacturing Facility (ASMF) in Launceston – a partnership between Definium Technologies and UTAS via Sense-T. In addition, the project established a viable commercialisation platform for the system which continues to interact with the Sense-T Data Platform, allowing for potential wider research applications in the future. There are also several potential expansions for the product suite that was developed as part of this project. On-farm research and sensors are informing a new app that improves water use efficiency and agricultural sustainability, enabling farmers to make better irrigation decisions and tailor their individual systems, soil and crop types. The Tasmanian Institute of Agriculture, University of Tasmania's ICT Discipline, the National Centre for Engineering in Agriculture (NCEA) and CSIRO collaborated on the $600 000 Project (Sense-T $510 000). On-farm research and sensors informed the development of a smartphone app to help farmers decide when and how much to irrigate, tailored to their individual irrigation systems and soil and crop types, to improve water use efficiency and agricultural sustainability. Blue-green algal blooms in drinking and irrigation water pose significant risks for human and animal health, as well as major resource challenges for water management agencies. 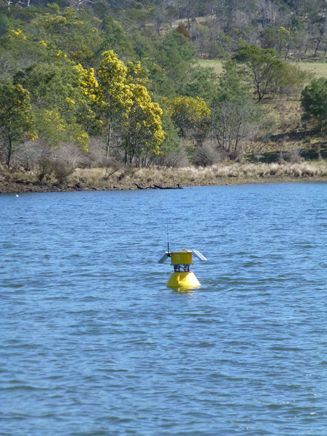 The BloomAlert project saw sensors installed at six locations in Tasmanian inland lakes and water reservoirs regularly affected by cyanobacteria blooms, providing real-time data on toxic algal biomass and early detection of algal blooms in drinking water and agricultural water resources. The project developed an automated and continuous in-situ water quality monitoring network, and established the feasibility of integrating high-res satellite imagery. Data from the sensors was received by a central server – the Sense-T Data Platform – and processed before delivery to water managers and regulators via a web dashboard. Project partners, including Irrigation Tasmania, TasWater and Hydro Tasmania, were able to use the information in real time as a warning system to guide their operational water management decisions and responses. For example, early detection – ahead of usual visual inspections by field staff - led to more timely and appropriate advice to recreational and public users to reduce the risk of accidental contact exposure. Reliable estimates of bloom trend and intensity avoided unnecessary control measures. During bloom events, weekly trend data meant water managers could target the most appropriate times for water samples to maximise sample value and limit unnecessary and uninformative collection and associated analysis costs. Water agencies were also able to implement management actions to maintain security of supply to irrigation water customers throughout a three month bloom. The work assists in tracking regional trends in water quality and safety, confirming site-specific differences in seasonal blooms. In future, researchers aim to combine the BloomAlert monitoring data with that from other dispersed sensor networks – such as the Bureau of Meteorology – to develop seasonal risk profiles for water storages and bloom forecasting capacity. The project also established the feasibility of extending the data network and methods for high-resolution remote-sensing of algal populations in inland lakes and rivers. Integrating the in-situ sensor data with satellite imagery has the potential to form a trigger alert for manual sampling at sites where cost or scale prohibit in-situ monitoring. Potential for commercialisation of specific outputs are being explored, while the project team is collaborating with the University of Adelaide to explore machine learning and to refine more complex prediction algorithms.